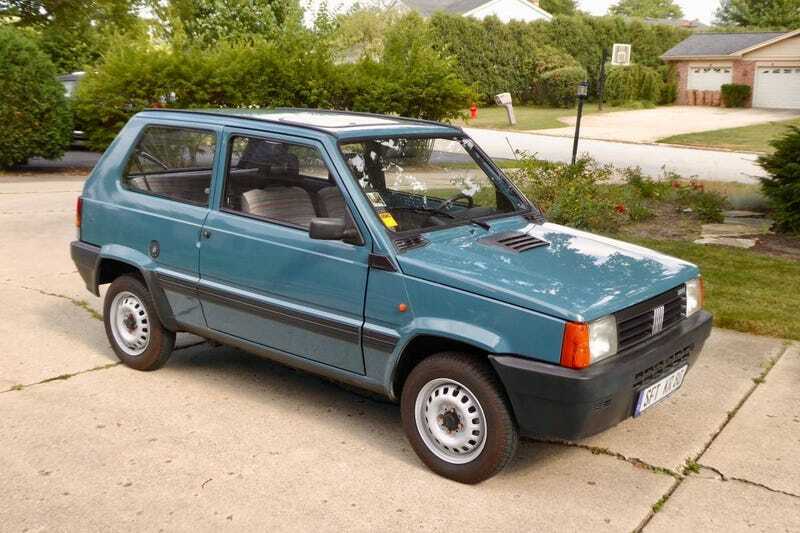 At $7,500, Could This Grey Market 1991 Fiat Panda 750 be a Small Miracle? The 25-year import rule allows a lot of interesting cars to be brought to the U.S. these days. With all those choices, someone decided to put the effort toward today’s Nice Price or Crack Pipe Panda. Let’s see if it was worth the wait. There are over seven billion people on the face of the Earth at present, give or take one or two. In that sea of humanity you, as an individual, may not matter all that much in the grand scheme of things. I’m sorry, but it’s true. You probably feel pretty special nonetheless, at least to yourself. That’s likely how the seller of last Friday’s 1991 Camaro Z28 1LE felt about his car too, seeing as he described it as being one of one due to its kit and color-combination caboodle. He seemed to price it accordingly, setting its asking at a cool $31,000. The teeming masses didn’t see it that way however, and dunned both price and car with an 85 percent Crack Pipe loss. That result really wasn’t all that out of the ordinary. You know what? I just realized that the last three cars in a row we’ve had—that Camaro, Thursday’s BMW 325iX and the Honda Civic Si we looked at on hump day—have all hailed from the 1991 model year. Hmmm, what are the odds? Well, might as well keep that streak alive. Here we have a 1991 Fiat Panda 750, which is a beneficiary of the U.S. Federal Government’s age-in allowance for violating the nation’s smog and safety rules. It’s amazing, at 24 you’re a risky and dirty scofflaw. Turn 25 however, and suddenly you’re welcome to the party. Like the drinking age, H.R. 2628, the Imported Vehicle Safety Compliance Act, seems set on a pretty random milestone and there doesn’t appear to be any empirical evidence or statistical determination supporting 25-years as the marker. Still, thanks to the IVSCA, it’s Panda time! This German import Panda is claimed to have once been constrained in its function by speed governors and a transmission lockout that would prevent it from attaining speeds greater than 25 kilometers per hour. For those of you repeating math, that’s a ridiculous 15 mph. Whatever the likelihood of ever driving a car with a 15 mph top speed without blowing your brains out in frustration, those limiters thankfully have been removed. That means this blue on stripy seated Panda now has a much more usable top end of about 78 miles per hour. Yes, it’s still not a fair fight on the highway, but remember, the Panda was originally intended to be a city car. Fiat added the Giugiaro-designed Panda to their lineup in 1980. It was an exercise in economization, featuring incredibly simple stampings and flat glass all around, even for the windscreen. At launch, the Panda’s engine choices were similarly modest, ranging from a 652-cc air-cooled twin to a 903-cc water-cooled four. How many other cars have offered both air and water cooled engines at the same time, I wonder? Get on that, please. This one features a 769-cc FIRE four cylinder under its short and be-scooped hood. That SOHC water-cooled mill puts out 34 horsepower and bunks in its bay with a full-sized spare. I don’t know about you, but I kind of love cars that keep their extra rubber with the engine. Maybe it’s because my first car was a Chevy Corvair. Backing up the tiny four is a four-speed manual gearbox with cable operated clutch in between. The whole car weighs a tinkerbell-like 700 kg (about 1,545 lbs). This could very well be the only Panda in the U.S. since, honestly, who really would go to the trouble, right? That makes it the nicest Panda in America, but it could easily hold that title even if there were a posse of Pandas here. It’s in really nice shape, with clean paint and a very tidy if not exactly safety minded interior. The condition is likely attributable to the meager 32,000 kilometers on the clock and the fact that it’s two previous owners were apparently German septuagenarians who never took the car above a brisk trot. A Grundig (best stereo brand name ever) radio/cassette deck lives under the dash and just above a fungal appendage-like ashtray. Instrumentation is limited to nothing more than an extremely optimistic speedometer and a gas gauge. Warning lights and a cool pictogram serve to to communicate the rest. The upholstery is in excellent condition and there’s a sunroof punctuating the roof to let the sun shine down on it. The seller claims the car to have been properly imported and to presently carry a clear Illinois title. In the car’s ad he states it to have no mechanical issues and avers it to be in excellent shape. The pics do bear out the aesthetics. It’s claimed that parts are just an eBay search away and in fact the only major sourcing issue might be the adorably tiny tires. The asking price is $7,500, and before you Europeans all start rabble rousing that you could buy a Panda of similar age for ten Euros, but why would you, understand that here in the U.S. we don’t have the luxury of buying such cheap cars. This is unique here and honestly, where are you going to find one in this nice of shape even in the Magic Kingdom that is the E.U.? Okay, let’s get down to it. What’s your take on this cool little Fiat and its $7,500 asking? Does that make this blue box a great deal? Or, does that make it a trash Panda?